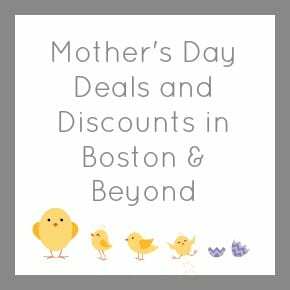 Where Mom Gets in Free on Mother’s Day in Boston! Mother’s Day is this Sunday, May 10th and I’ve rounded up fun and inexpensive things to do with mom– especially because she gets in FREE to a lot of places on Sunday! Sturbridge Village: Free admission (and a special gift, while supplies last) for Mom on Mother’s Day! Roger Williams Park Zoo (Rhode Island): Free admission for Mom with a paid child’s admission this weekend! Davis Farmland (Sterling, MA): Kids, bring your mom for free on May 1oth! Mela Restaurant: Moms eat free on Mother’s Day! Dosa Factory: Moms eat free on Mother’s Day with coupon (1 per table)! If you are looking to do a daily deal for mom (or yourself), LivingSocial is offering 20% off local deals with promo code MOM20 through Sunday, May 20, 2015.